Jay McShann was born January 12, 1916 in Muskogee, Oklahoma. He died December 7, 2006. In the years between, he wrote himself (and Kansas City) into the history books as one of jazz’s most successful and influential bandleaders. His professional music career began in 1931 where he worked gigs around Tulsa, OK and Arkansas. It didn’t take him long to realize that Kansas City was the place to be. McShann first stopped in Kansas City in 1936 on his way to visit his uncle in Nebraska. He knew of Kansas City’s reputation for lawlessness, a wild nightlife and swinging jazz, so he decided to stop by the Reno Club one day while he waited for the bus. To his dismay, the Count Basie band had already headed east for a tour. Instead, he was confronted by musicians from the Bus Moten Band who persuaded him to stay in KC. He began freelancing clubs lining 12th and 18th Streets and soon received a steady engagement at the Monroe Inn on Independence Avenue. Hootie gained recognition for his versatility in playing boogie-woogie, blues and jazz. Journalist Dave Dexter wrote about McShann in the Kansas City Journal and Metronome, deeming his raw talent as equal to that of Count Basie, who was already one of jazz’s biggest icons. In 1936, things began to change in Kansas City. Once elected to office, Governor Stark turned on Tom Pendergast. Stark refused to turn a blind eye to the lawlessness and corruption in KC and he proceeded to enforce liquor laws and close clubs earlier than 2 a.m. Regardless of Stark’s attempt to clean up the city, the young Hootie managed to thrive in a suffering jazz scene. In 1936, he became friends with amateur pianist Walter Bales Jr. who had many connections in KC. With the continued support of Dave Dexter and Walter Bales, McShann achieved a steady and well-paying job for his band at Martin’s, an elite club on the Country Club Plaza. Regardless of the start of World War II, McShann managed to travel to New York and become popular there as well, playing both the Apollo Theater and the Savoy Ballroom. By 1942, McShann began having problems with Parker, who was having problems of his own relating to his addictions to narcotics and alcohol. Furthermore, by late winter 1943, a sum of travel difficulties and the war draft had taken it’s toll on the band. McShann decided to join the GAC (General Amusement Corporation) and began to tour under their banner, playing up to 90 consecutive one-nighters. Unfortunately, the band could not be redeemed. On May 21, 1944 while getting ready to play at Municipal Auditorium in KC, McShann was inducted by draft officials. With McShann training to go to combat, the band members dispersed throughout the country. Thus ended the last great jazz band to come out of Kansas City. After the war ended, it was safe to say that the big-band era was over; McShann tried in vain to reform his once great band. Determined not to fade off into history, he worked with several smaller groups. In the 1960s he regained popularity as a singer as well as a pianist and he recorded and played live throughout the rest of his life. He was survived by his long-time companion, known as Marianne McShann, and three daughters. 1. Driggs, Frank, and Chuck Haddix. Kansas City jazz: from ragtime to bebop : a history. Oxford: Oxford University Press, 2005. 2. Wikimedia Foundation. “Jay McShann.” Wikipedia. http://en.wikipedia.org/wiki/Jay_McShann. 3. 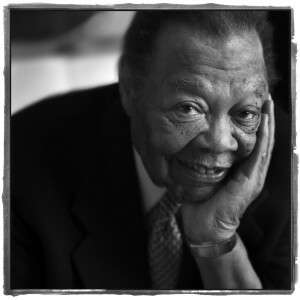 “BoogieWoogieArticles.” An Interview with Jay McShann. http://www.colindavey.com/BoogieWoogie/articles/jmi.htm. 4. NPR. “.” NPR. http://www.npr.org/programs/jazzprofiles/archive/mcshann.html. 1. 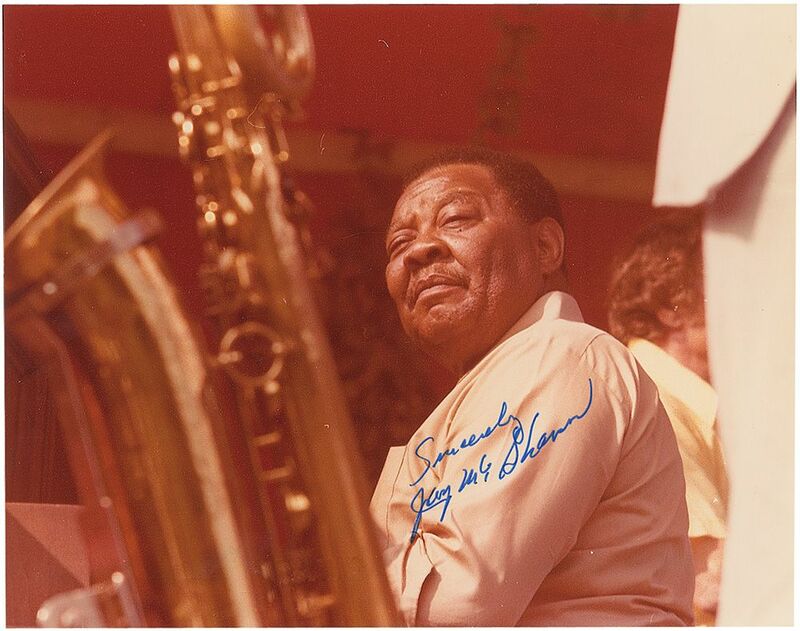 “Jay McShann.” iCollectorcom Online Auctions Upcoming Auctions. 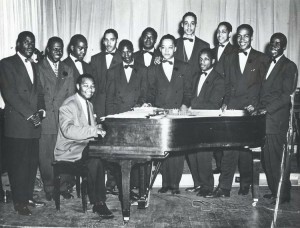 http://www.icollector.com/Jay-McShann_i13560276. 2. “Fine Art of Jazz: Photographs by Dan White.” Fine Art of Jazz: Photographs by Dan White. http://www.eusa.org/exhibit/fineartofjazz. 3. “Musicians Local 627.” Musicians Local 627. http://library.umkc.edu/spec-col/local627/photos/war/mcshann-p014.htm.